This LM4811 Dual 105mW Headphone Amplifier can be used in applications like cellular phones ; mp3 , cd , dvd players pda’s and other portable electronics . Maximum power delivered from TDA4811 is 105mW per one channel into 16 ohms load impedance and 70mW with 32 ohms load impedance. Lm4811 headphone amplifier is designed to provide a high quality output power using few external components and does not require bootstrap capacitors or snubber networks . Main features of LM4811 headphone amplifier are : digital volume control range from +12dB to −33dB,no bootstrap capacitors required , low shutdown current. 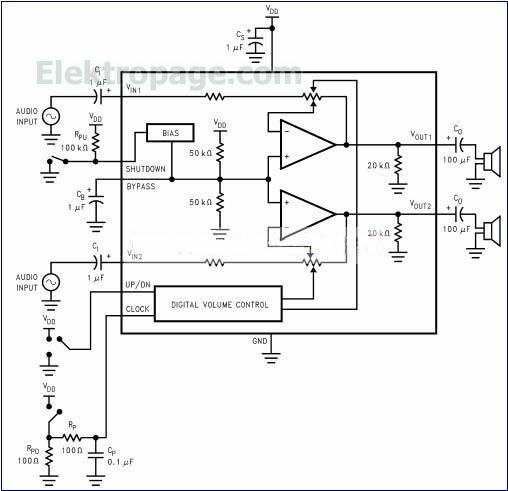 This audio headphone amplifier require a power supply between 2 and 5 volts.